We met in the park, Curly, O’Reilly, Lester and me. I was the oldest, the leader, I’d lived here 11 years, my entire life. I found a place we could slip through the fence. The pipe ran from the top of a steep bank forming a tubular bridge to the opposite side. The railway tracks were 20 feet below. Lester was the youngest. He went first and walked straight across. O’Reilly was short but smart. He started upright but soon sat down. Lester talked him over. Curly’s dad was a gambler. He knew a bad risk when he saw one, turned around and crossed the bridge nearby. I squatted, shuffled forward. I froze half way, felt dizzy and wanted to throw. Lester looked on, O’Reilly squawked like a chicken, Curly sniggered. I heard the train, shimmied to the other side, humiliated, undignified. Lester said we’d better go, we all followed. I had a safe and pleasant childhood, growing up in a small village surrounded by woods and motorways. I was a sensible child. I liked books. I studied hard at school. I didn’t take risks, most of the time. Shimmying across the pipe was a stupid, dangerous thing to do. A dare by the youngest, most reckless member of my gang. And when I scribbled down 20 or 30 memories, it was the one that stood out, which still stirred fear, over forty years later. I finally told my mum last week. She wasn’t very happy. 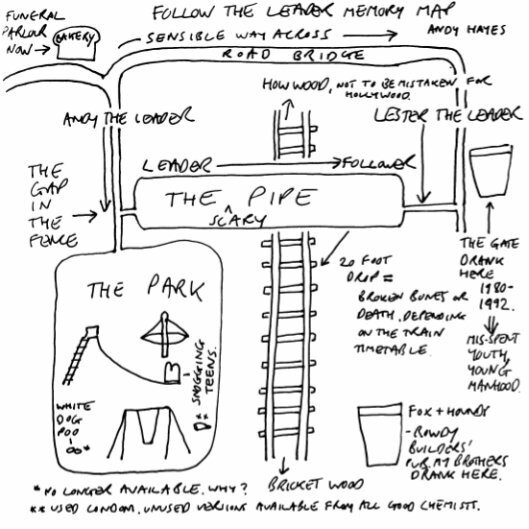 Never thought a memory map would provoke in me a weird nostalgia for white dog poo, but you’ve managed it, Andy. It’s disappearance is one of life’s great mysteries: diet, perhaps? ; owners of white-pooing dogs ALWAYS bag and bin? ; global warming? Oh, yes, liked the story, too.